Unsure why, I am not a big fan of eating noodles in any form, and with that, I naturally dislike cooking it unless the blog called for it. 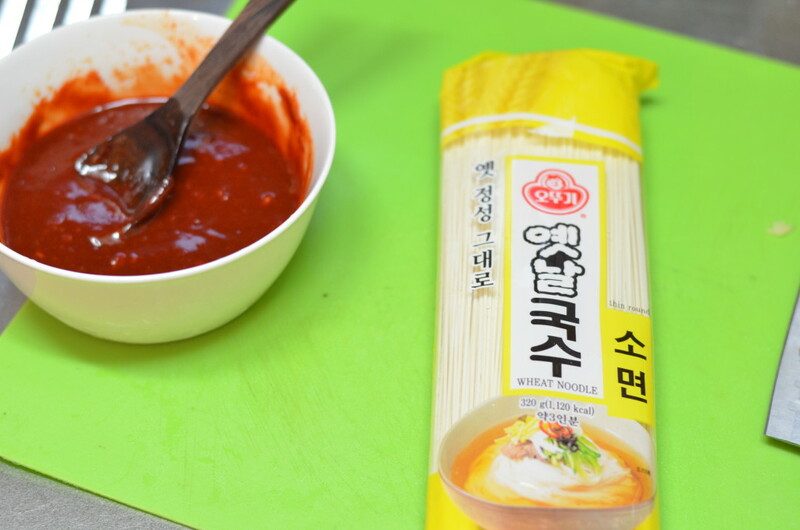 But when you are living in Korea and have a partner who loves noodles, there are always exceptions to be made. 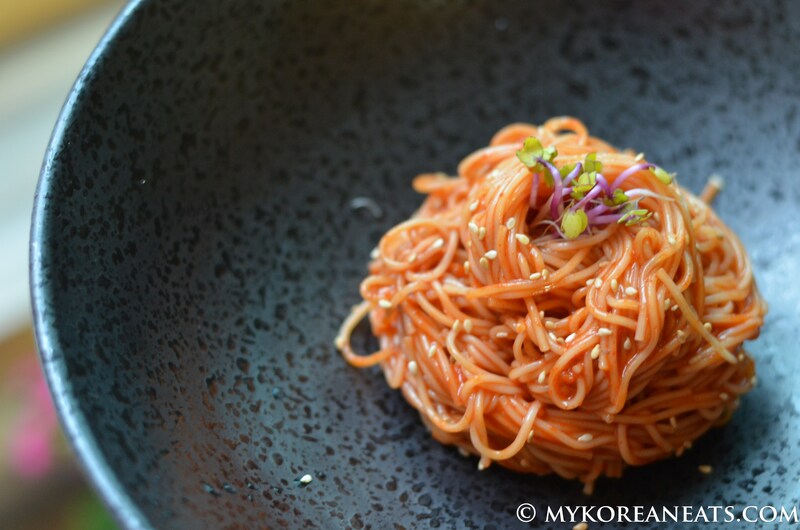 Recently I have been making different variations of bibim myun (spicy cold noodles w vegetables), a dish often served in the summer months and regularly as a side dish at Korean BBQ joints. 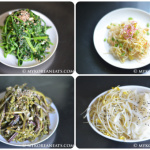 This dish is great because you can modify the “toppings” with any vegetables and greens you like. 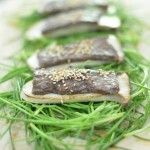 But most importantly, and like most dishes in Korean cooking, the key is in the sauce. It was trial and error trying to get the sauce the way I like it—sweet, spicy, sour, and tangy—but after only three attempts, the sauce of my dreams was achieved and fully approved by my taste taster. For all the noodle lovers out there, this one is for you. 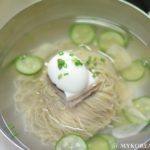 More about bibim myun: a semi-sweet and spicy cold noodle dish that can be made in a short period of time. 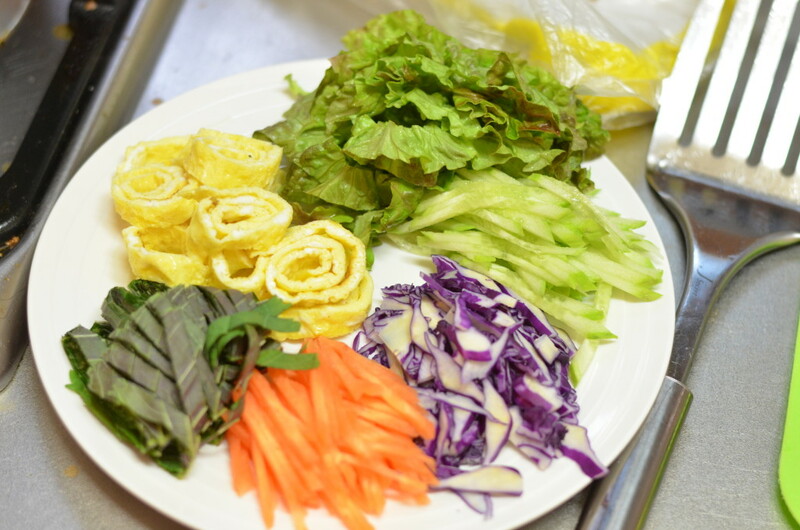 Common ingredients/toppings include julienned cucumbers, thin beef slices, Korean pear, and hard-boiled eggs (similar to that of its cousin naeng myeon, cold noodles), but any lettuce varieties and vegetables can be substituted in place of them. In many Korean restaurants, this will be served in a large stainless-steel bowl. Mix and match ingredients to your liking, and then prepare the vegetables and greens accordingly like this. 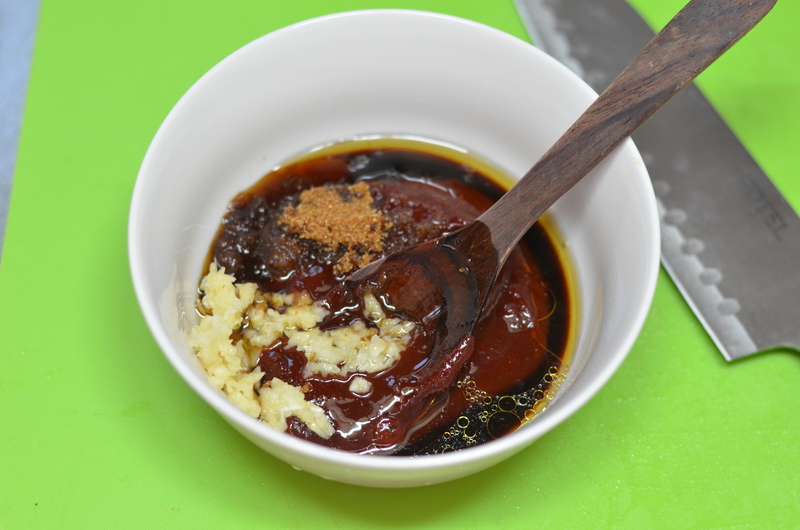 The sauce is a combination of gochujang (red pepper paste), cider vinegar, sugar, sesame oil, and minced garlic. Whisk two eggs with a few tbsp of water in a mixing bowl. Then on a non-stick pan, fry into a thin sheet. Cook the noodles according to package directions. 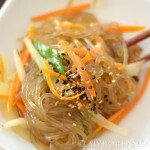 You can either use somyun (white wheat flour noodles) like I did here or naeng myun (buckwheat noodles). 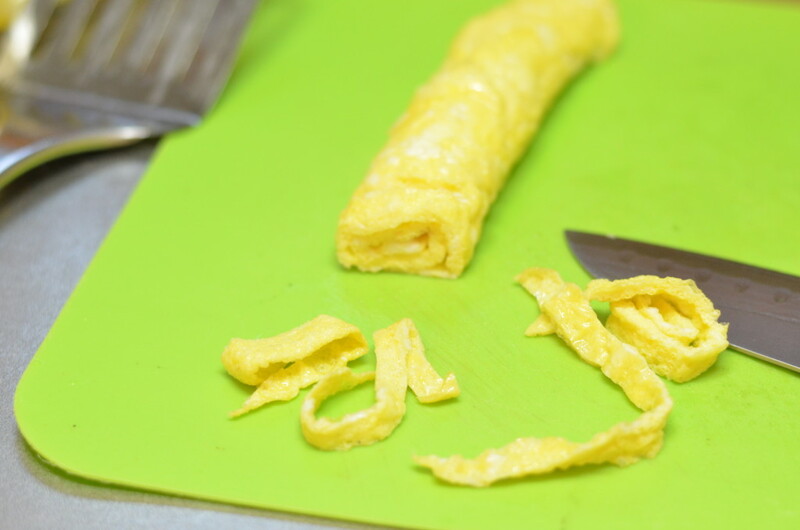 After the egg is fried, let cool for a few minutes and make into a roll; cut into thin strips. 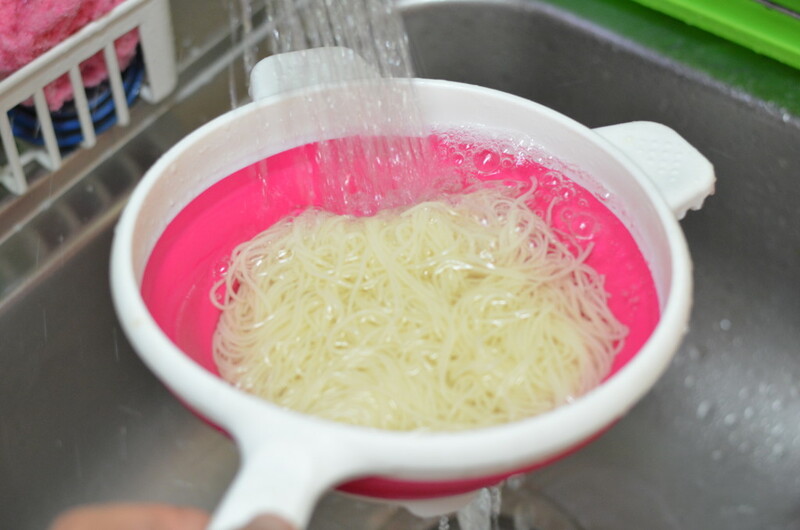 For the noodles, be sure to rinse under running cold water. It can be served immediately once cooled. I usually make a big batch that will last a day or two. Here is a single serving that I had the following day. Here is one of the larger versions that was shared among three hungry adults. Here is a simplified version that can taste quite impressive without any vegetables. Combine all the sauce ingredients (last 8 items on the list) together in a mixing bowl, set aside. Crack the eggs and stir well until egg white and yolk are mixed. Heat a pan over low heat and add a generous amount of preferred cooking oil. 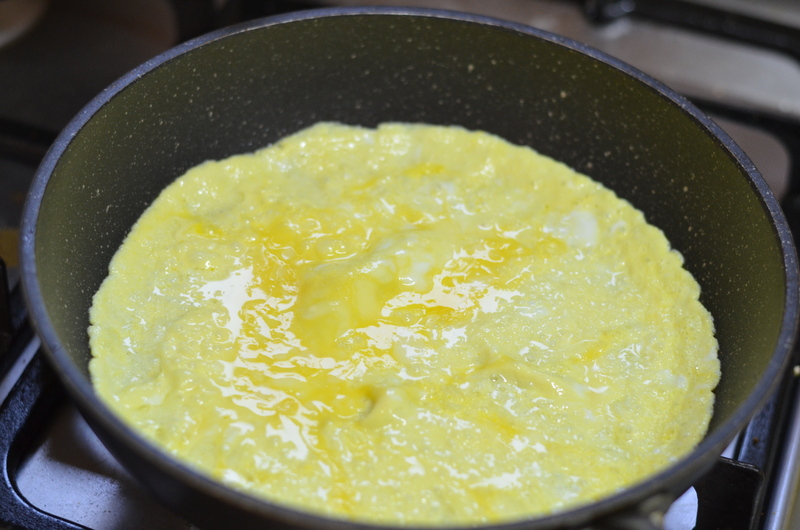 Pour the stirred egg and cook both sides to make a thin pan-fried egg sheet. Cool the pan-fried egg completely before slicing. 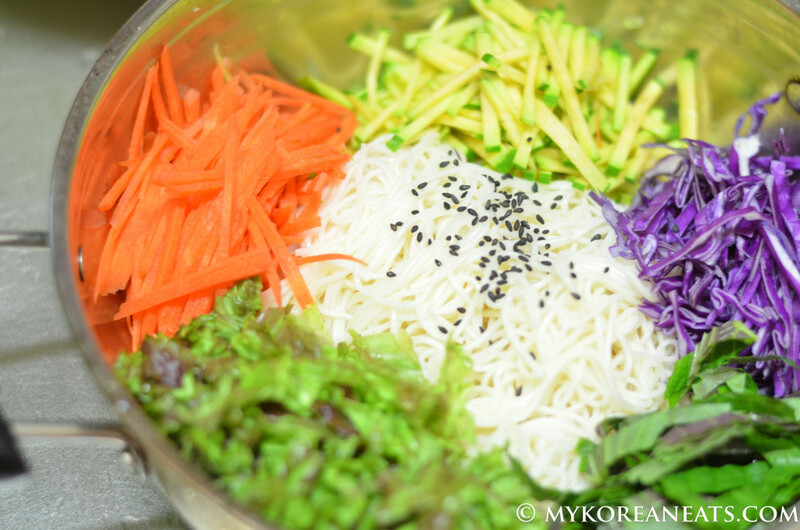 After washing all vegetables and greens, slice the ingredients/toppings into thin matchstick pieces, set aside. Boil a pot of water with a pinch of salt, then cook somyun according to package directions. Drain noodles with a strainer, and wash it under cold running water until it is completely cooled, set aside. 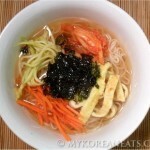 In a large bowl or serving dish, add the cold noodles and top with sauce. 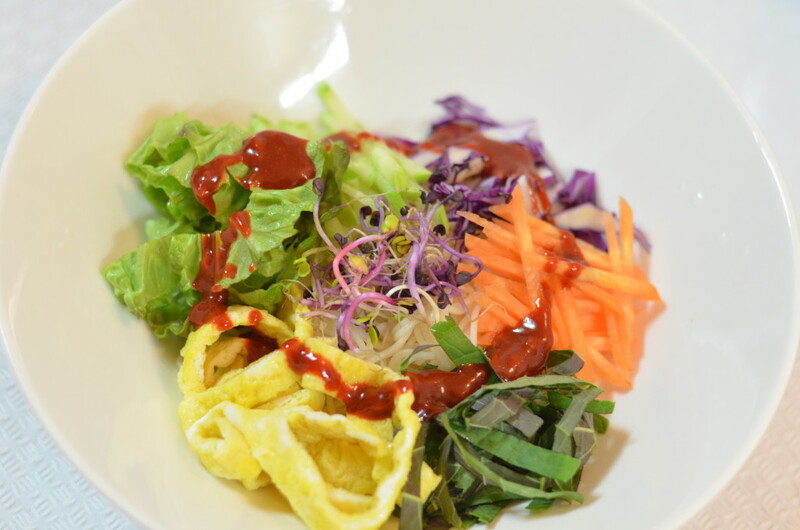 Garnish with available vegetables and greens. Enjoy! !